I know there is so much going on right now–our hearts are heavy with the burden of caring for Japan, its people, and the surrounding areas. I know a lot of people are not able to help financially with all of the charities and causes they would like. I found myself in a situation. My friend’s sister posted on Facebook that she was going to do the Relay for Life in memory of her sister. I was on my phone when I read the post and I told her I wanted to do it too. I didn’t even know what it was. I didn’t understand the “relay” part of it. When I got to a computer and I was gathering information someone said to me that it is difficult to raise money. I stopped. I had not thought about that. I was just thinking that I would be walking to support. I had completely forgot that part of that support is raising funds. Then my friends and I had a discussion about our annual MS Walk. 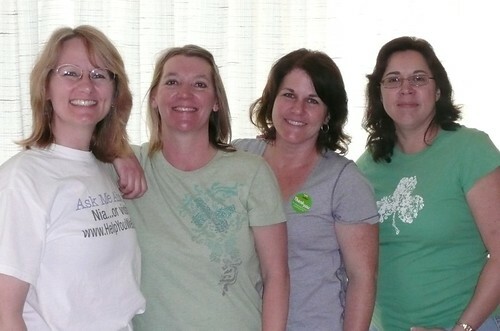 We have been walking in the MS Walk for at least three years now. We were discussing how it is always difficult to ask for money. Having to raise funds for the MS Society and having to obtain donations for the Relay would make it more of a challenge. I thought about it. I thought, “What can I do?” What can I give so that others can get something for donating? Well, for the Relay for Life I thought of a benefit Nia Class. I contacted a Twitter Friend of mine that owns a gym. I approached him with what I would be able to pay in rent, in order to have some left over for the donation. He has a big heart and he is donating the gym time. (SUHWEET!) I am donating my time, so 100% of all proceeds are going to go to the American Cancer Relay for Life. I will be walking in May. But I don’t want my walk in April for the MS Society to be forgotten either. So I have to mention that too. Also the studio in Los Gatos where I teach my Friday Nia class is also doing a Relay For Life walk. I am hoping to do that one too, somehow, but it is on the same day as the MS Walk and I will be unavailable that day so I have to see if I can participate in this Relay on Friday by walking Friday night OR just by raising funds. I have to work out these logistics before I post that link. 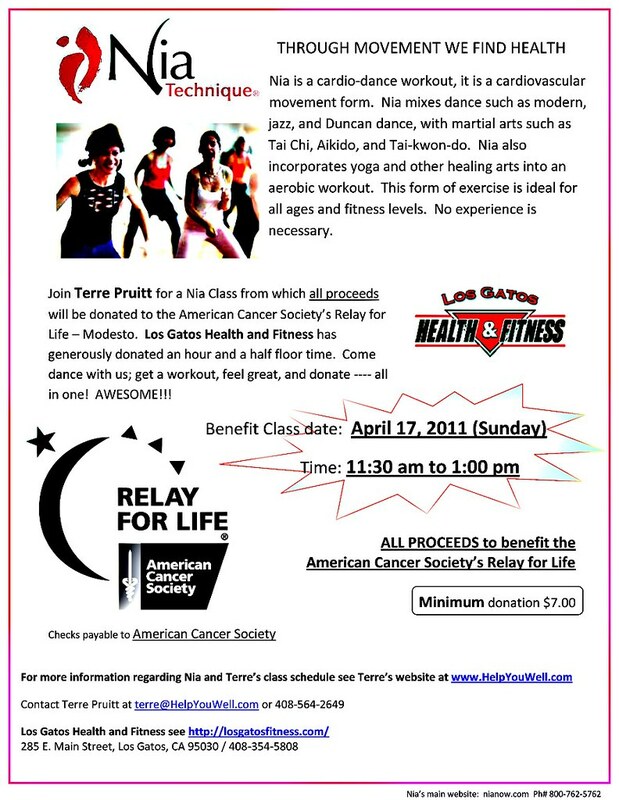 For the American Cancer Society’s Relay for Life that my friend is doing for her sister and my friend, come to my Nia Class Sunday, April 17, 2011 at 11:30 am in Los Gatos. The minimum donation is $7.00 — all of which will go to the American Cancer Society. Please see my website, HelpYouWell.com for details. If you can’t make it to the class you can donate via the following link if you would like. If you would like to donate to my walk with the MS Society that if great too. It is understandable that you will probably have to pick one to donate to. So follow your heart. Remember giving to these causes is an act of love, so please do not give more than you comfortable can. We all would like to give hundreds and hundreds of dollars, but that is not possible, so remember every little bit counts so give what you can. If money is not something you can give, then please do think positive thoughts for both of these causes. I know that they will be needing all the help they can get. I believe that movement, like Nia, can help keep our bodies mobile and balanced. I also believe foods can give us nutrients to help our bodies function better. I believe there are natural ways to help stave off disease. But I do also believe that at anytime our cells can malfunction and cancer can occur. I don’t try to eat healthy with the idea that if I do I won’t get cancer because so many things can contribute to cancer. So many people have it. I was just remembering the days when I didn’t know anyone that had cancer. Now I know too many. There are so many different types. There is no guarantee one will not get cancer. On a commercial recently for a show I saw a doctor asked who gets lung cancer, her response was, “Anyone with lungs can get lung cancer.” That is the truth. Anyone can get it. Unfortunately. What I DO really believe is that a healthy body can fight it better. A lot of the treatments for cancer kill off good stuff in our bodies as well as the cancer. So if we have a strong healthy body it can combat the offending cells and treatment. Healthy people get sick, but they can often recover faster because they have a base of good health. A body can only handle so much. It is not able to fight off everything thrown at it. There is too much now-a-days. So the healthier the start, the better. I know a lot of foods claim to decrease the risk of cancer but that is usually not what I am thinking about when I eat it. I am thinking about how the food is thought to assist in the function of the body. I am thinking about how I believe that the ingredients on my avoid list* interfere with the body’s healthy functions, which could very well result in a decrease risk of cancer, but will definitely result in your body FEELING better. Plus I believe that when your body feels better you will actually FEEL better emotionally. None of us want to get cancer so foods thought to decrease the risk are worth consuming, but I think it is unwise to think that we will not get cancer because we are eating foods “proven to fight”/”shown to decrease the risk”. We should concentrate on eating well to feel well and stay healthy.